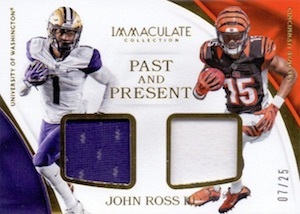 Premium sets come and go but 2017 Panini Immaculate Collection Football is a good reminder that NFL collectors have long enjoyed the perks that Immaculate offers. In this case, that ultimately means five high-end autographs or relic cards and a base card per hobby box. While slightly tweaking the look from 2016, many of the elements remain virtually the same, which is not a bad thing. Displaying a simplistic and refined design that has become very familiar over the years, 2017 Panini Immaculate Collection Football includes 100 cards in the base set, each numbered to 99, with Gold (#/5) and Platinum (1/1) parallels. One base or parallel card comes in every box. 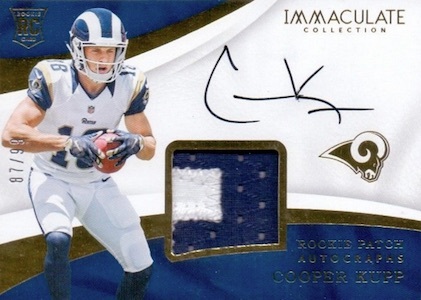 However, truly putting the "immaculate" in the 2017 Panini Immaculate Collection Football checklist, the various autograph and memorabilia hits offer many appealing options. 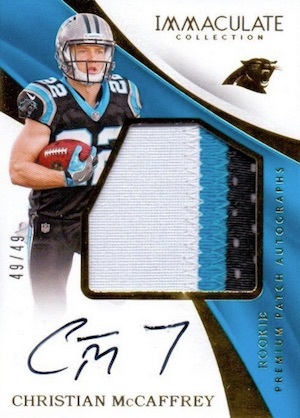 The popular Rookie Patch Autographs (RPA) subset continues to have a foothold in the brand and in the hobby. 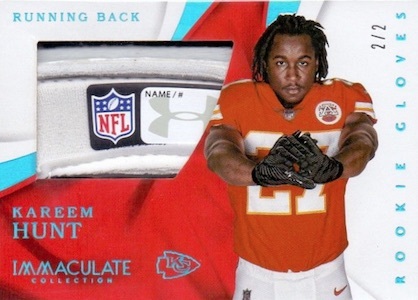 Horizontal in layout and limited to just 99 copies, the on-card offerings also feature one-of-one Laundry Tag and NFL Shield parallels. 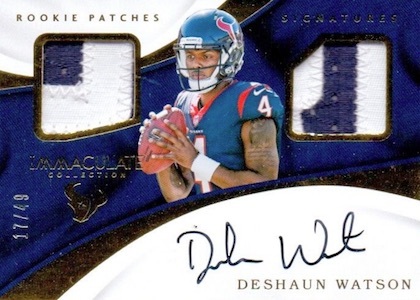 The vertical Premium Patches Autograph cards match the RPAs in quality and print run, and are joined by Immaculate Rookie Patches Signatures and Immaculate Players Collection Autographs. Other hard-signed inserts in 2017 Panini Immaculate Football include Immaculate Moments (#/25 or less) that highlights key performances or events for top players, Super Bowl Moments (#/25 or less), which focuses only on the champions, plus Dual Autographs and Triple Autographs. Among the new sets are Immaculate Honors and Immaculate Shadowbox Signatures. Even with all those autographs, the 2017 Panini Immaculate Football checklist leaves room for some magnificent relics. Pushed to the max are the full-sized versions via Jersey Numbers, Laundry Tags and Team Logos. Containing the brand and model notation from the ball, Rookie Pigskin Logo is a new choice. 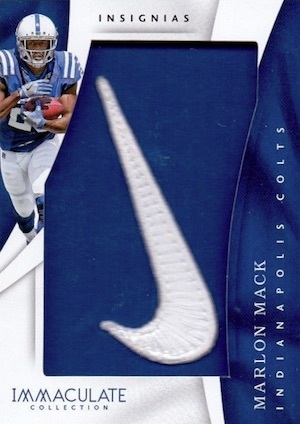 There are also many rookie relics including Rookie Gloves. Lastly, giving collectors an elusive chase on the memorabilia side, Dual NFL Shields (1/1) presents a combo card set of epic proportions. 2017 Patrick Mahomes Immaculate RPA Rookie Patch Auto #59 99 Wow! ***TRUE 1 1*** Patrick Mahomes 2017 Immaculate Collection Patch Auto R C RARE!! PARALLEL CARDS: Gold #/25, NFL Shield 1/1, Platinum Tag 1/1 (No Chris Godwin*). PARALLEL CARDS: Gold #/10 or less (No Heath Miller*), Platinum Tags 1/1 (No Montana, Tarkenton, Walker*), NFL Shield 1/1**. Multiple players not found in Shield parallel. **View specific info with the spreadsheet. 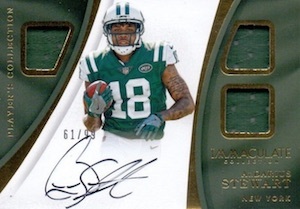 PARALLEL CARDS: Gold #/25 or less, NFL Shield 1/1, Platinum Logo 1/1. PARALLEL CARDS: Gold #/25 or less, Platinum Tags 1/1. PARALLEL CARDS: Logos #/25 or less, Insignias #/5 or less, Authentics #/5 or less. PARALLEL CARDS: Prime Gold #/10 or less, Prime Platinum #/5 or less, Tags 1/1. PARALLEL CARDS: Prime Gold #/5, Prime Platinum #/3 or less, Tags 1/1. PARALLEL CARDS: Gold #/5 (Cards #7-10 - 1/1*). 4 cards. Serial numbered #/17. PARALLEL CARDS: Gold #/2, Platinum Tags 1/1. PARALLEL CARDS: Prime #/25 or less, Pro Bowl Logo #/2, Brand Logo 1/1. 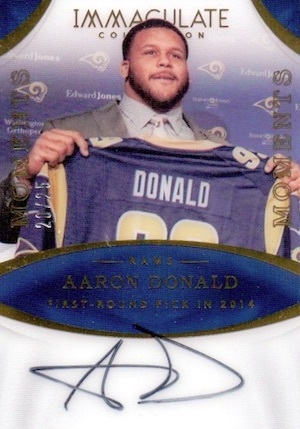 PARALLEL CARDS: Wrist Logo #/5, NFL Shields #/5 or less, Team Logos #/5 or less, Laundry Tags #/2. All subjects not included in Shield/Team Logos parallels. View specific options with the spreadsheet. 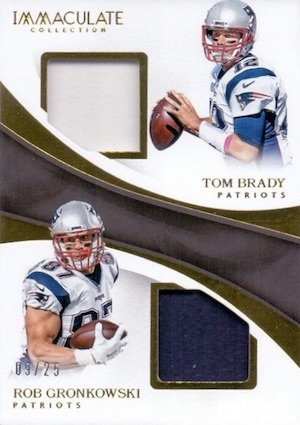 PARALLEL CARDS: NFL Shield 1/1. PARALLEL CARDS: Pigskin Logo 1/1. PARALLEL CARDS: Brand Logo 1/1, Heel Logo 1/1. PARALLEL CARDS: Prime #/10 or less, Brand Logo #/2 or less.